Mayoral hopeful Bob Brady announces his parole-system plan yesterday, flanked by supporters (from left) state Rep. Louise Bishop; AFSCME leader Bob Zimmerman, state Sen. Mike Stack and District Attorney Lynne Abraham. U.S. REP. BOB BRADY called yesterday for the city to hire 300 more parole officers and to revamp the probation system to put it under the control of the mayor, not the court system. 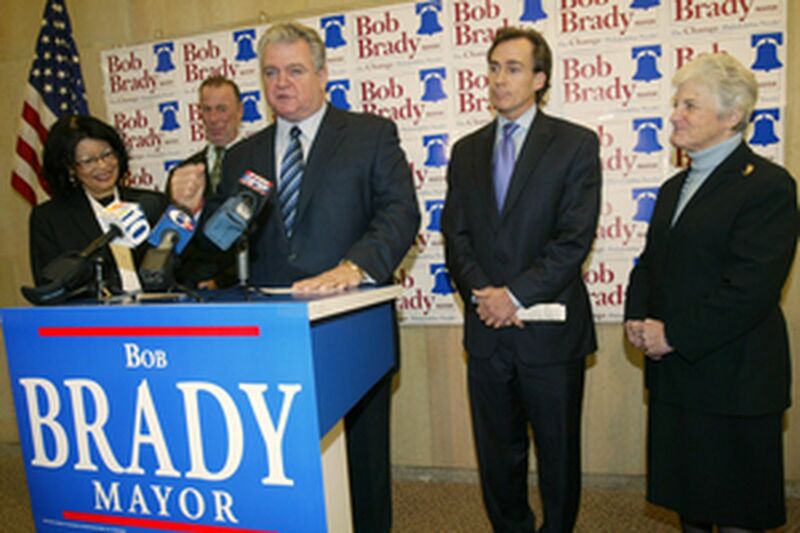 "They [probation and parole officers] do an excellent job," Brady told reporters at his mayoral-campaign headquarters. "They are undermanned, they are understaffed, they do not make enough money and there are not enough of them. . . . They now report to a bureaucracy in the state court system, but I am going to make them report to the mayor. . . . The mayor is the one who gets all the hits with the problems we have with murders in the city." Besides hiring more officers, Brady said they should be stationed throughout the city in decentralized, community parole offices, with automated check-in equipment so that parolees wouldn't have to spend hours in line, waiting to speak to their parole officers. Long-term, the city could save money by using modern global-positioning-system devices to keep track of people confined to their homes or facing other travel restrictions, Brady said. He estimated that his proposals would cost taxpayers about $30 million a year - an amount he suggested he could raise on his own with personal appeals to state and federal legislators. Brady was flanked by District Attorney Lynne Abraham; the parole officers' union president, Bob Zimmerman; and a couple of state lawmakers, Rep. Louise Bishop and Sen. Michael Stack, who endorsed Brady's proposals. Other mayoral candidates have identified the city's handling of ex-offenders as a critical issue in handling with the city's crime problems. Former Councilman Michael Nutter has proposed tax credits for employers who hire ex-prisoners and creation of a "public-safety cabinet" to conduct weekly meetings of city officials - including judges and the D.A. - with law-enforcement responsibilities. The city's court administrator, David C. Lawrence, said he would welcome any steps to reduce the heavy caseloads of probation and parole officers, who sometimes are responsible for up to 200 ex-offenders. "Anything we can do to lower caseloads would be a very positive thing," Lawrence said. "We need the funding to do it." Lawrence confirmed Brady's observation that parole officers used to be stationed throughout the city. They were centralized in Center City back in the 1980s, he said, to provide closer supervision, to save money on support services and to provide easier access to the criminal courts, where parole officers are frequently asked to testify. The city's president judge, C. Darnell Jones II, said he supported both a significant increase in the number of probation and parole officers, and the idea of putting them into neighborhood offices. But he said he'd have to review Brady's proposal to put the officers under the control of the mayor rather than the courts.